That’s the reaction we got from our parents when we recently told them we were heading back to South Dakota. Being self-proclaimed “wanderlusters”, it’s not often that we go to the same place twice. 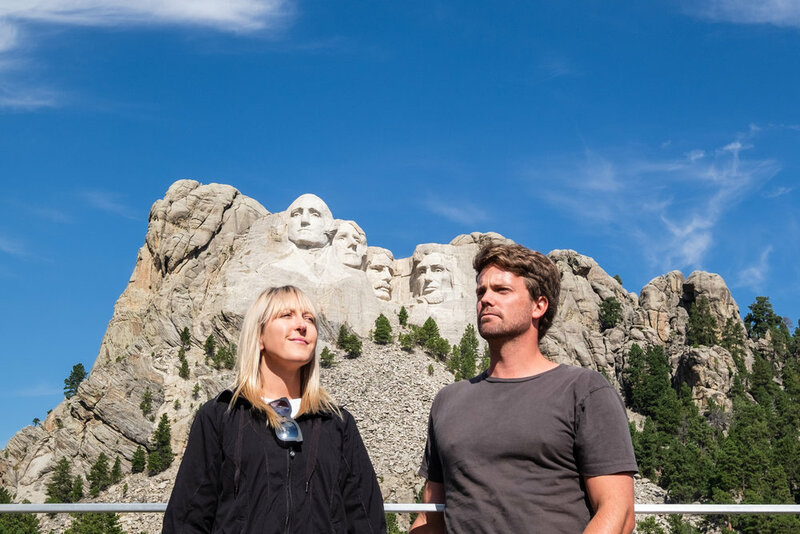 We’re always keeping things interesting and exploring new destinations… so needless to say, returning to South Dakota just a year after our first trip came as quite the surprise to our family! Here’s the deal with South Dakota. There is SO MUCH TO SEE. It definitely takes more than one trip to experience everything that this grand state has to offer. Whether you’re an adrenaline junky looking for the next thrill, or a hiking enthusiast looking for the next scenic peak, or a history buff, fascinated by American history and folklore, South Dakota has something for everyone. Still hesitant about it? We’ll prove it to you. 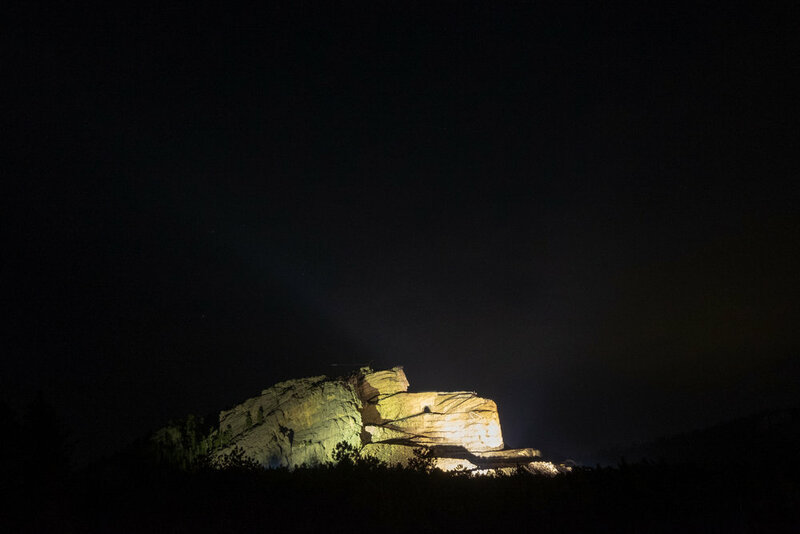 South Dakota is filled with gems (literally and figuratively). Little iconic towns that slip under the radar, but shouldn’t be missed - like Deadwood! Deadwood, South Dakota is straight out of a country western novel. Legends like Calamity Jane and Wild Bill Hickok roamed the historic streets of Deadwood, looking for gold and a good time. And it’s still a darn good time!! You can catch a free Wild West re-enactement, get your game on at the many casinos in town, and grab a drink at the notable Saloon #10. We love nothing more than blasting some country music and exploring new scenic roads. Pretty much EVERY road in South Dakota is scenic, and there wasn’t a time Alli didn’t exclaim “Wow! So pretty!” when we were driving. On our first trip to South Dakota, we were blown away by Needles Highway. It’s 14 miles of twists and turns through sprawling granite spires, and located just 30 minutes south of Rapid City. This time around, we ventured through Spearfish Canyon, a DREAM of a drive for anyone that loves wildlife, outdoor activities, and breathtaking waterfalls. Built on an old rail bed, the views from this drive are fantastic, and filled with photo opportunities along the way. No matter how many times we see it, Mount Rushmore continues to amaze us. There’s no doubt that George Washington, Thomas Jefferson, Theodore Roosevelt, and Abraham Lincoln would be in awe of this epic mountainside memorial. The sheer magnitude and precision of Mount Rushmore is jaw-dropping, and it’s no wonder that it attracts over two million visitors annually! And then there’s Crazy Horse. Crazy Horse is the world’s largest mountain carving, and even though it isn’t yet completed, it’s a monument that can’t be missed! Crazy Horse was a Native American war leader that earned great respect from both his people, and his enemies. He’s one of the most iconic Native American warriors, and participated in several famous battles during his lifetime. The memorial is funded entirely by private donations, and to this day there is no set completion date. But you can go visit this incredible monument, and even watch a laser show there at night! 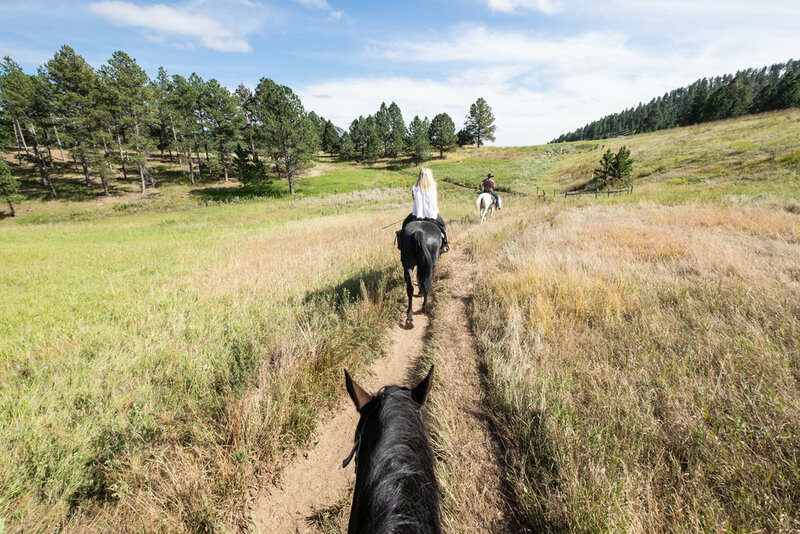 From horse back riding, to hot air ballooning, to kayaking and mountain biking, the opportunities for adventures in South Dakota are limitless. 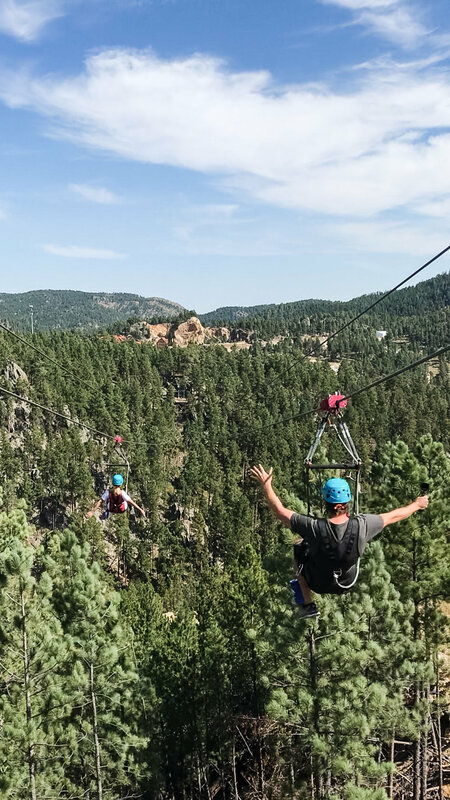 On the last day of our trip we went zip lining with Rushmore Tramway Adventures, and it was EPIC!! You fly over a mile of forest, reaching heights of up to 400 feet, and unobstructed views of Mount Rushmore! The guides are friendly, knowledgable, and full of wit and humor. Our two hour tour flew by! (Literally) It’s absolutely a South Dakota adventure you do not want to miss. Oh, and did we mention how comfortable our harnesses were? They use top-of-the-line equipment, making the entire process a breeze. We’ll be back! You read that right. We’d be lying if we said the steak dinners in South Dakota weren’t one of the main factors for our return trip. If you love a good steak and you love a good deal, make note. Some of the best steaks we’ve had (at some of the best prices! ), are in good ol’ South Dakota. One of our favorite places for steak and all the fixin’s is the appropriately named Legends Steakhouse in Deadwood. Located in the historic Franklin Hotel, Legends is one of the best places for steak in the state, and the long lines and rave reviews will prove it. Reservations aren’t required, but we recommend you make one. And be sure to get a side of the truffle mac n cheese… we’ve been craving it ever since! If these five factors haven’t solidified your need for a trip to South Dakota, then we give up! Just kidding. But quite frankly, we could keep going! The friendly locals, the abundance of wildlife, the campgrounds, the museums and amusement parks… South Dakota has it all. We can’t wait to return and adventure there again - who’s joining us next year?! Older PostForever Honeymooning - Even With a Dog in Tow! THROWBACK THURSDAY :: Take Us Back To Carmel, CA! Looking For Your Next Weekend Escape? Head to Idaho!